The office vacancy rate in Windsor is more than triple the national average while average net rent is half what is being charged nationally, according to third-quarter projections released this week by real estate broker CB Richard Ellis. The figures show that Windsor has 600,000 square feet of vacant office space for a vacancy rate of 19.2 per cent which is up from 18.2 per cent in the second quarter. The national rate is 5.7 per cent. Of the 10 other metropolitan areas surveyed, only London with a vacancy rate of 16.6 per cent comes close to matching Windsor's. Following London is Montreal, 8.6; Winnipeg, 8.3; Waterloo, 7.2; Toronto, 5.8; Halifax, 5.5; Edmonton, 5.1; Ottawa, 4.1; Calgary, 3.1 and Vancouver, 3.0. Windsor's average net rent of $10.26 per square foot is the lowest of the cities surveyed and less than half the national average of $21.99. London has the second-lowest net rent of $11.87 followed by Waterloo, $12.34; Winnipeg, $15.25; Halifax, $17.24; Montreal, $18.09; Edmonton, $22.55; Toronto, $22.76; Ottawa, $24.50; Vancouver $29.13 and Calgary $43.90. So tell me, exactly why is it that Windsor cannot attract any significant corporate interest when we have so many things going for us? Proximity to markets, low operating costs and lost cost of living for employees are usually some of the first things business relocators look for in a market. Maybe it has nothing to do with our physical amenities, or lack thereof. Maybe, as many readers have noted, it has more to do with City Hall than our unions and pollution - the usual scapegoats? Question, why is our office vacancy rate so high? 2. Windsor decided to build an office building instead of leasing vacant space downtown. September 25, 2007 at 3:14 p.m. Anyone ever think that maybe there is a problem on OUR end why people are visiting Windsor less and less? Could it be the fact aside from an art gallery and a casino, we really have nothing to offer people in our core? A major museum? scratch that. Same things can be applied for attracting locals and businesses to locate downtown. The "leaders" of Windsor seem to only point fingers at others for our problems and ask for handouts from the government instead of looking at facts and searching for solutions. September 25, 2007 at 5:00 p.m.
Realistically, we know the capital problem is temporary. We have a regular movie theater which many North American downtowns lost and now can't get back. 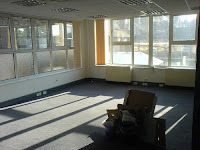 Our problem is that we think attracting office tenants will help. Most downtowns in North America actually stopped devoting resources towards getting office tenants. They have realized that office tenants drive their cars to underground parking, take an elevater to and from their office and never actually see a street. The new focus across North America is on mixed use developments, Commercial main floor with residential above. Beztek did a tour of their development in Canton Michigan. They had stores on the main floor with 2-4 floors of residential above. Many downtowns are going back to the old days where they offer an owner operated shop with a condo upstairs. It works for graphic designers, artists, Lawyers, accountants and the creative class. Taking down the norwich block was a mistake, it would have been fully leased with activity on the main floor. But not enough amenities? where do they have more in southwest ontario? Our Riverfront is enough by itself. Where else could you find that view for that cheap? September 25, 2007 at 9:05 p.m. I agree with you. Compared to other parts of Windsor, downtown has much, MUCH more to offer. However, in comparison to other cities with which we must compete to attract jobs, I personally think we are lacking in some areas. Mixed use developments are definitely the way to go. Placing the U of W Engineering Building in the empty lands downtown is great, but, there should be some commercial and residential mixed in with it. Also, I hope they avoid placing any surface parking on any of those lands. With an underutilized parking garage next door, there should be plenty of parking already available if you include the spots on the street. We also need to offer more incentives for businesses locating and renovating existing downtown buildings. I wasn't necessarily talking about offices when discussing locating downtown, but also retail. People are choosing not to come for a reason. Weekend visitors love to walk, shop, eat and take in culture. We already have the dining in place as our restaurants are top notch and comparable to, if not better than, any city. Our beautiful AGW building, the WSO and great festivals such as Bluesfest and Epicure add to the cultural component. However, I still feel quality retail, especially clothing stores, are few and far between in our core. Also missing are family attractions. Converting the Armouries into a first class, hands-on museum would go a long way to start the flow of families back to the downtown. We should also look into the possibility renovating the old bus terminal lands and use them as an outdoor pedestrian only market. Our riverfront park system and trail is unbeatable and it is great to see that all Windsorites take immense pride in it. It is time to have the same pride in the rest of our downtown. The revitalization begins and ends with the locals. We need to realize how important a healthy downtown is to our local economy and start locating our new businesses, as well as possibly locating established ones, in the core instead of on the outskirts of our city. If we are not willing to do this, how can we convince outsiders to do so? September 26, 2007 at 12:12 a.m. I still think its the chicken and the egg again. Do residents create more retail or does more retail create more residential? I have always believed and will always maintain that more residential will bring retail. Its not just more residential, its getting the highest demographic of spenders you can. September 26, 2007 at 8:26 a.m.